Everyone here at Climate Storage knows one thing for sure: Nobody enjoys moving. It can be just as stressful as doing taxes or driving the family cross-country to Walley World. However, we're doing everything we can to make it easier for you by doing things like offering our customers our FREE Move-In truck! You’ve probably seen our truck sitting out front right as you come in. 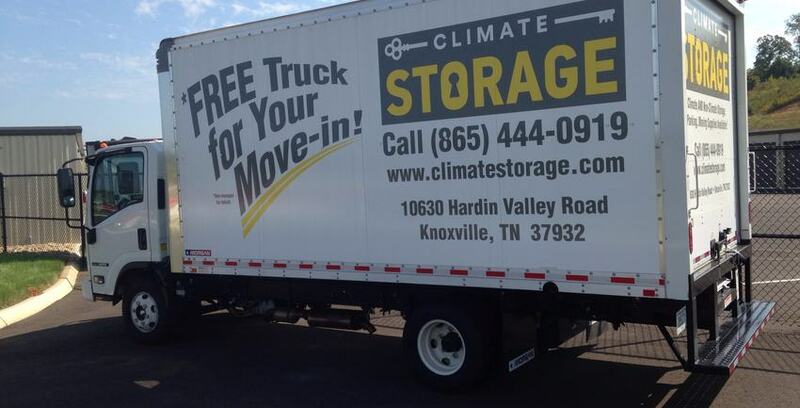 Did you know that, as a Climate Storage customer, YOU can use the truck for FREE whenever you are moving things into your storage unit? We do need you to make a reservation first. Call us or come by the office to see if the date and time you need the truck are available. (865) 444-0919 during business hours. On the day on which the truck is reserved, show up a few minutes before your reservation time at the office with your driver’s license, proof of comprehensive and collision insurance, and a $100 CASH deposit. For legal reasons, we can only rent to the person on the lease, so make sure that if your name is listed on the lease, and that you are the one who shows up to get the truck. If you want someone else to drive the truck, that’s fine. We just need you here to sign out the truck. Just before you’re ready to finish your move in with the truck, drop by your favorite gas station and top off the gas tank. Be sure to save your receipt and turn it in when you turn in the keys. You’re only paying for the gas that YOU used. NO CHARGE for 25 miles or less. After 25 miles, it’s only 89 cents per mile plus tax. Once the truck is checked back in with correct fuel, no damages, on time, and ready for the next person to use, you’ll get your deposit back. If we’re closed, you can pick up your deposit the next time we’re open. The truck is an automatic transmission vehicle so it operates just like your car or truck. It uses regular-unleaded gasoline so any station that sells gas is fine for the refuel. We’ve got 2 stations within walking distance of our facility. There are also 2 banks near us if you forget to get the cash for the deposit. Use of the truck is limited to 4 hours per customer. However, if you need to use the truck again a few days (or weeks) after you first use it, as long as it’s not reserved, you can use it again. The only time you can’t use the truck is for move-OUTs. Other than that, it’s just another one of the many advantages of storing with us at Climate Storage!